Ask anyone about influential moments in music and 1968 will be near the top of that list every damn time. So many different genres came together to create a soundtrack that’s lived beyond one generation and helped define an era. So, as you hop into a Lassiter Leopard and cruise through Mafia III’s streets of New Bordeaux, crank up the radio. You’ll have more than 100 classic songs that will send you back to a very different time. Rather than make you wait until the game’s launch on October 7, though, you can groove to the sounds of 1968 New Bordeaux starting today on Pandora with the Mafia III Hit List. You’re one link away from this awesome collection of classic rock, country, soul, blues and popular music straight from this transformative era in American – and music – history. In addition to this curated soundtrack, Mafia III also tapped two of the gaming industry’s greatest composers, Jesse Harlin and Jim Bonney. The two have composed an original score you’ll hear during gunfights, cut scenes and other in-game moments. The 26-track Mafia III Original Game Score is will be available for digital purchase on iTunes, Amazon and the Google Play stores. 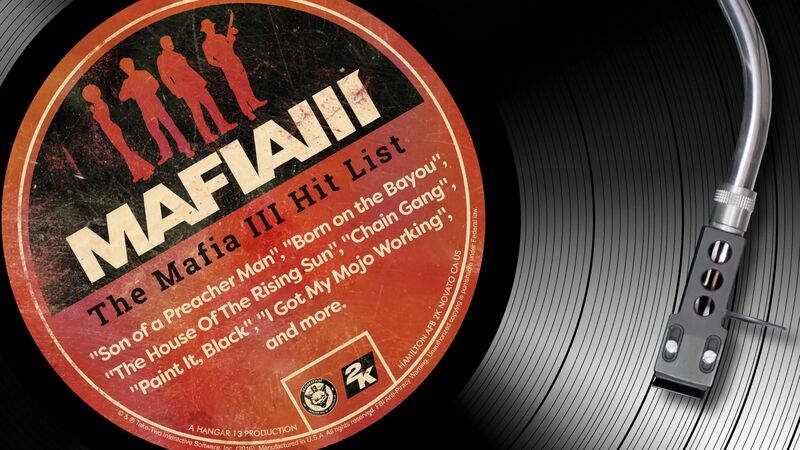 A version of that score will also be available on vinyl in the Mafia III Collector’s Edition. That’s right, the Mafia III Collector’s Edition comes fully loaded with the sounds of 1968 New Bordeaux on 180 gram vinyl. Besides that, you can score a collectable art book, art prints, and a whole lot more. More details on that here.